All joints are susceptible to arthritis, including those of the neck. We also call this form of osteoarthritis ‘cervical osteoarthritis’. It is a rheumatic condition caused by wear and tear in the cartilage of the inter-vertebral discs of the neck. Cervical osteoarthritis mainly affects people aged 60 or older.. The cervical vertebrae form the upper part of the spine. Between two vertebrae, there is always an inter-vertebral disc, which consists of a ring of fibrous cartilage with a gel-like core. These inter-vertebral discs are elastic and absorb shocks caused by movements. The cervical vertebrae are very flexible and allow you to bend your head forward, backward and sideways. The many muscles and ligaments around the cervical vertebrae keep the neck stable while you are moving. 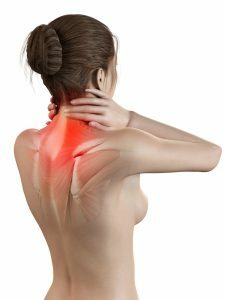 What are the symptoms of arthritis of the neck? 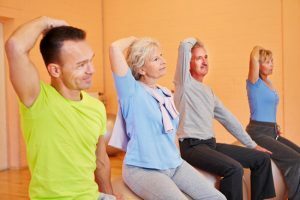 As we get older, the cartilage of the inter-vertebral discs can start thinning, creating little bone spurs – also called ‘osteophytes’ – which can exert pressure on the nerves. The first symptoms of osteoarthritis of the neck are pain and stiffness, headaches, pain in the shoulders and arms, and the inability to bend or turn the neck. In a more advanced stage, osteophytes can also press against the bone marrow, which can cause a tingling sensation, numbness, and decreased strength in the arms, hands, legs, and feet. In serious cases, cervical osteoarthritis can also result in coordination problems, abnormal reflexes, and muscle spasms. Another common symptom is a shooting pain in one or both arms. The symptoms of cervical osteoarthritis resemble those of a cervical hernia. Did your symptoms start following a car accident or a fall (down the stairs, for example)? Then it may be a whiplash. The main difference between cervical osteoarthritis and whiplash is cartilage thinning, which occurs with cervical osteoarthritis but not with whiplash. This is clearly visible on an X-ray or MRI scan. Patients suffering from cervical osteoarthritis tend to have more symptoms if they keep their neck in a bent or stretched position for longer periods. Sitting in a reclined position for a long time and lifting heavy objects can also worsen their symptoms. The best way to ease the pain is to lie down and have a rest, and keep the neck warm. Many people who suffer from cervical arthritis also report dizziness. The bone spurs on the inter-vertebral discs narrow the space between the cervical vertebrae and cause dizziness. As a result, the arteries that carry blood and oxygen to the brain are slightly ‘pressed shut’. This reduces the blood supply to the brain, which results in certain neck movements causing dizziness. How will my doctor diagnose and treat cervical osteoarthritis? A physician through an X-ray can diagnose cervical osteoarthritis. Sometimes a CT, bone, or MRI scan can be necessary to determine the severity of the wear and tear. One of the best pieces of advice in case of cervical arthritis is to rest the neck as much as possible. The physician can also prescribe anti-inflammatories to control the pain and he will often refer patients to a physical therapist as well. Last but not least, patients can opt for a natural alternative. For example one containing liquid Green-lipped mussel and Curcumin, which is just as effective as traditional medication, but without any of the nasty side effects. Sometimes your doctor may advise you wear a neck brace, which limits movement and gives the neck additional support and rest. Consequently, cervical osteoarthritis patients need to keep moving the neck through regular exercise, which maintains mobility and suppleness in the cervical vertebrae. In addition, muscle-strengthening exercises mainly promote stability of the neck muscles, enabling them to carry out their support function more efficiently. Lie on the floor with your arms beside you. Pull in your chin while pushing your neck to the floor. Count to five and release. Repeat ten times and do three sets, with a 30-second break after each set. Stand up or sit upright, pulling your chin in a little. Relax your head and turn it to the right as far as you can, then move it back to the starting position and turn it to the left as far as you can. Repeat ten times and do three sets, with a 30-second break after each set. Stand up or sit upright. Bend your head to the left, moving your ear to your left shoulder. Continue until you feel your muscles tense up. Count to three and repeat on the other side. Repeat ten times and do three sets, with a 30-second break after each set. Stand up or sit upright, pulling your chin in a little. Turn and bend your head to the left. Do not strain. Count to three, return to the starting position and repeat on the other side. Repeat ten times and do three sets, with a 30-second break after each set. Stand up, pulling your chin in a little. Place your hands on top of one another on the back of your head. Relax your shoulders. Press the back of your head slightly against your hands, exerting counter pressure. Count to five and release. Repeat ten times and do three sets, with a 30-second break after each set.